All transactions are safe and secure with a reliable history in online purchasing behind each of our associates. Buy the Where the Wild Things Are Book and Maurice Sendak Children's Books to own Where the Wild Things Are clothing and merchandise. Explore the imaginative works of illustrator and author Maurice Sendak. 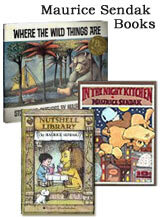 From his adventurous book Where the Wild Things Are to works like Higglety Pigglety Pop!, the Nutshell Library, Chicken Soup with Rice and the controversial In the Night Kitchen, Maurice Sendak has brought a new dimension to children's literature, one that has caught the attention of both young and old readers alike. Pair a Maurice Sendak book with a t-shirt from our gallery. In addition to the Where the Wild Things Are Book and Maurice Sendak Children's Books above, browse the Where the Wild Things Are Clothing Gallery for more apparel like men's and women's clothes, kids shirts or hoodies.